UNITED NATIONS, October 21, updated with Q&A -- China is contesting the right of the UN Sudan Sanctions Committee to transmit to the full Security Council its most recent report, which “presumes” the use of Chinese bullets in Darfur, without having unanimous consent. Despite "Western" media reports that China lost this fight on October 20, on the morning of October 21 a Chinese diplomat told Inner City Press that in the past, the reports have been transmitted on behalf of the Committee, and not by its chairman in his personal capacity. “He can't do that,” the Chinese diplomat flatly said. Asking for a response, the Committee's chairman, Austria's Ambassador to the UN Thomas Mayr-Harting told Inner City Press that the Committee will proceed "according to the rules, as it always has." He did not comment on the difference between transmittal "on behalf of the Committee" or in his personal capacity. The Chinese diplomat also criticized the Committee's chairman, Austria's Ambassador to the UN Thomas Mayr-Harting, for deferring too much to the members of the Panel of Experts. China believes that whatever the Experts' academic pedigree, the Experts work under the supervision of the 15 countries on the Council and Committee. The subtext is that of late, on issues such as the South Suden secession referendum slated for January 9, China as well as Russia have not objected, even to such “over the top” events as US Ambassador Susan Rice rallying with South Sudanese police trainees in Rejaf outside Juba earlier this month. But, some say, if the Western countries continue pushing on this Sanctions report, the relative ease on South Sudan and other issues may come to an end. Watch this site. Footnote: some are pointing to a US violation of sanctions, when North Korean tank parts were allowed in to Ethiopia while it was intervening in Somalia. There were also UK arms sales to Sri Lanka in the run up to what then UN humanitarian chief John Holmes called the “bloodbath on the beach.” We favor transparency -- but also, no double standards. To be continued. Q: Reuters reported that, according to a Security Council diplomat, the latest report of the Panel of Experts on Sudan says a dozen brands of bullet casings found at sites of attacks on U.N./African Union peacekeepers in Darfur came from China, and that China has tried to block its publication. Does the Chinese Mission have any comment? Yutong LIU, Chief Press Officer Chinese Mission to the UN: “The latest report of the Panel Of Experts on Sudan has serious drawbacks. A number of references in the report are not based on facts and lack of solid evidence. Some of the conc1usions of the report are vague and unclear. Some are even based on the Panel’ s own conjecture and presumption. This is not consistent with the requirements of the Security Council that the Panel of Experts should carry out its work in a responsible, objective, impartial and professiona1 manner. The Panel of Experts uses a large amount of UN budget and resources every year. It should improve its performance. UNITED NATIONS, October 20 -- China in a rare public shoot-back at other UN Security Council members issued a statement Wednesday night disputing the accuracy of the report of the Council's Sudan sanctions committee, and implicitly threatening to cut the committee's funding. In the airport in Nairobi, Li told Inner City Press that his country would be perfectly willing to meet and speak with Sudanese President Omar al Bashir, if the other Council members agreed. At a South Sudanese police training base in Rejaf, as US Ambassador Susan Rice essentially rallied for Juba's independence with a tentful of police recruits, Ambassador Li said softly that “it is very sensitive” -- but nevertheless never requested off the record treatment, or asked to be identified as a “Security Council” (or “Eastern”) diplomat. On the other hand, China has recently been further flexing it muscles, for example against Norway for the Peace Prize decision of the Nobel Committee. Does Wednesday night's statement indicate a Nobel-ization of Security Council debate or merely a shot across the bow? Watch this site. REJAF, SOUTH SUDAN, October 7 -- A military band greeted Susan Rice and 13 other Security Council Ambassadors on Thursday morning at this police training camp on the banks of the Nile River. The minister of internal affairs of the Government of South Sudan, Gier Chuang Aluong, gave a speech, in which he accused the government of Omar al Bashir of supplying ammunition not only to cattle rustlers but also the Lord's Resistance Army. Susan Rice did not react to this accusation, rather smiling broadly as South Sudan military figures praised her. 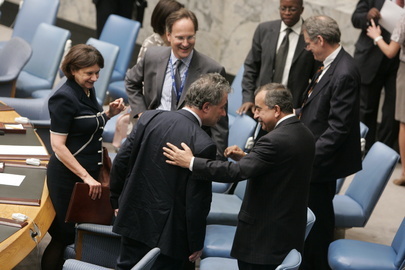 As the Security Council delegation took a tour of the facility, compete with mock hijackings of VIPs in four by four vehicle, fought off by the just trained police, Inner City Press asked another Council Ambassador if he was comfortable with the tone of the visit to Rejaf, sometimes called and spelled Rajaf. “It's a very sensitive situation,” he said, going on to wonder what the government of Sudan in Khartoum would think of this show of readiness for independence and with what some call its Susan Rice “cult of personality” aspect. Others say it is merely Susan showing her passion. One Permanent Representative was conspicuously absent: Russia's Vitaly Churkin. It led one to wonder how such a Council Mission to Kosovo would have looked, while UNMIK was running it, before the unilateral declaration of independence. There, the UN's watchword was “status neutral.” Was that only because Serbia had Russia taking its side in the Council? Watch this site. Footnote: the last leg of the Susan Rice portion of the trip, a visit to Wau, was canceled when the UN plane, run by Swift Air, broke down on the Juba tarmac. The entire delegation moved to the Russian base of UNMIS. Things started friendly, but then a Russian commander ordered the Press to stop using the Internet. UGANDA, October 6 -- President Yoweri Museveni took questions from the Press after meeting with the Security Council on Wednesday. Inner City Press asked about calls to investigate the killing of civilians in Mogadishu by Ugandan and Burundian troops. President Museveni said that those his forces killed “in June, July, August” must have been combatants, since they were assaulting a fortified position. But what about killings of civilians in markets? President Museveni said he does not favor the shelling of such areas. Inner City Press posed similar questions last month to Jean Ping of the African Union Commission, who responded angrily that Al Shabab insists on using human shields and even fighting from mosques. He did not speak about disfavoring response. Uganda's Ambassador to the UN Ruhakana Rugunda said that the Lord's Resistance Army was discussed in the meeting with the Council. Inner City Press asked if Uganda thinks the UN mission in the Congo MONUSCO is doing enough against the LRA bases in the Congo. President Museveni said that the LRA is degraded, so degraded they had to go to “the Central African Republic and Darfur.” He praises his “revolutionary” forces, citing Mao about a people's army not taking a needle from the people without paying for it. Three times he praises Tanzania for sending 45,000 to throw out Idi Amin. About the UN's Mapping Report on the Congo, President Museveni said he hadn't read it, but it must be fiction. There are fiction writers, he said, in international organization. 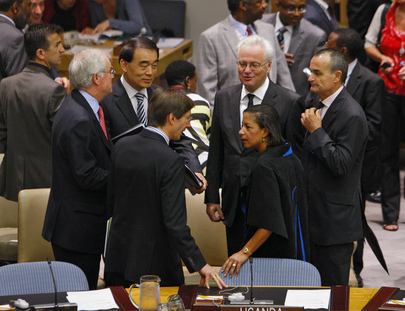 US Ambassador Susan Rice sat stonefaced. What is the US view on what happened in Rwanda, and the Mapping Report? Watch this site.